Abstract: Using survey research from 2010-2012, the author describes in unprecedented detail the capacity and practices of local public media newsrooms. His survey work provides staffing, budgeting and programming patterns. It also provides an initial baseline from which to track emerging trends in local public media news. This installment provides an overview. It is derived from a presentation to the Broadcast Education Association in April 2013. The census of journalists found 3222 people are paid to create the local news you get from public media stations. Radio employs the largest share of these news people. ﻿ Below is another look at the same data… only this compares full time local news workers to the part timers… and the contractors. Almost two thirds of the journalists are full time employees. Seventy-five percent of the journalists in public media are employed by 25% of the stations. The chart below sorts newsrooms by "weight class" -- a schema created by the author as a way to talk about news room sizes. On the left are the featherweights, newsrooms of 1 full time or less. Over half the stations have newsrooms in the featherweight class. As the newsrooms get bigger, we have fewer of them, but more journalists employed. A third of all local public media journalists are from the middle weight newsrooms. Having only just established our baseline measurement of newsroom employment, we can't yet say by what increments they are changing. However, we have general trend information indicating they have been growing every year from 2010 to 2013. The chart below -- from the 2010 newsroom survey -- shows that more than a fourth of all public media stations saw actual growth in 2010 or predicted growth in 2011 in their local newsrooms. Similarly, only more robustly, the same question in the 2012 survey showed both actual growth in 2012 and projected growth in 2013. What do those local journalists do? Here is how their primary roles sort out systemwide. Note the very small slice that are tasked with online duties. Also note the rather small slice devoted to editing. In the majority of newsrooms, people have to wear two hats. Below is the distribution of these secondary roles. Again, the online role is a small slice. The editing slice gets bigger when it comes to being a secondary role. While online workers were a very small part of the local public media news force, that is not to say that stations weren't tasking their people with online responsibilities. The data below, from 2010, show most local news workers (62%) share online duties with their broadcast duties. So online is a big part of the picture… as stations migrate from the broadcast platform to the digital platform. Many people have a foot in both areas. The following charts were taken from the 2012 survey of local public media newsrooms. They assess the degree of "commitment of resources" to various broadcast news programming types. Next, in terms of common commitment, is the staple of local news coverage: the news feature. Some say public media doesn't cover breaking news. But that's not true. This category of content seems to be gaining station commitment. Local news talk shows show a high commitment from more than a third of public media stations. Local radio and TV news magazines are resource intensive. Not of lot of stations can commit to them. While local stations are seeking more ways to engage their communities, it would appear that conducting on air town hall meetings is not the way to go for most. Likewise, producing local news commentaries is anathema to the vast majority of stations. Earlier we showed evidence of stations growing their local news staffing. Below, we see that stations are also increasing the amount of air time devoted to local news. What types of online news content are local stations offering? These charts are from the 2012 survey of local public media newsrooms. They are presented in order from most common to least common online content types. Online audio gets high commitment. Not surprising given our radio-dominant sample. Text is the predominant news vehicle online. It ranks highly among local stations. Facebook ranks as a high commitment among a third of stations... and as a medium commitment from another third of stations. Similarly, Twitter showed significant commitment by local newsrooms. Comparied to 2010 (not shown), Twitter showed a significant increase in local station prevalence. Use of photos in local online news? More medium commitment than high commitment. At this point, there's a rather big drop off in the online efforts of local public media stations. More than half of stations give low commitment to online comments. Even fewer lean in the direction of blogging. While video is considered very appealing to online users, local public media are generally uncommitted to video in local online news. Maps, too, are unlikely to be found in the online offerings of local public media newsrooms. One more. User-generated content is among the least likely content forms to be found in local public media news. The 2012 local news survey shows how widely stations are stepping up their online offerings. This chart looks at online growth for the year 2012. Over half the stations increased their online news quantity. The chart that follows shows the percentage of stations planning to increase local online news in 2013 is roughly two-thirds. When asked to evaluate their local news according to NPR standards, almost two-thirds of stations were satisfied or very satisfied with what they were putting on their broadcast transmitters. However, much of that satisfaction turned to dissatisfaction when the same question was applied to online news content. Only a third of stations are satisfied or very satisfied with their online news. Questions about the capacity and capabilities of local public radio and television newsrooms is of national, timely significance. In light of harsh media disruption, there have been numerous calls for public media to step up and serve the information needs of local communities (Knight Commission 2009) (Downie & Schudson 2009) (Cochran 2010). Public media is trying to respond to the call. Prevalent thinking emphasizes local (and national) public service journalism (SRG 2010) (Kling 2011). The Corporation for Public Broadcasting has invested widely in such efforts as Local Journalism Centers, Localore, NCME, a local ethics project and the "Public Media Platform" for digital distribution. Moreover, professional membership groups like PRNDI, PRPD, DEI and others are emphasizing local news funding and training projects. The data here provide a baseline by which we can eventually compare the future to the past. It also indicates where the present action is. We see positive signs. Stations are growing their local news ranks. They are adding local news programming. And they are really pushing for more local news online. But we can also see that the response has been uneven. The bulk of the local journalism efforts have come from radio stations. The heavy lifting is getting done by the larger newsrooms. And there remains a big gap between what's happening on-air and what's happening online. 2010 Census of Journalists (CPB/PRNDI 2010) – The first ever attempt to count every journalist in local U.S. public radio and TV stations, as certified by the Corporation for Public Broadcasting. The study was sponsored by CPB, contracted to Public Radio News Directors Inc., and conducted by Michael V. Marcotte with help from Steve Martin and Ken Mills. This online, invitation-only survey reached 516 public media organizations (89% of the target universe of 576 organizations). Data used by permission of CPB. 2010 Supplemental Survey of Stations (MVM/PRNDI 2010) – A survey run by Michael V. Marcotte, in partnership with PRNDI. This online survey was optional for those filing the 2010 Census of Journalists and reached 397 organizations. 2011 Station Activity Survey (CPB 2011) – The annual data collection survey conducted by CPB in conjunction with its community service grant process. Included here is a new (and voluntary) section to begin regular tabulation of local news personnel. 504 organizations participated. 2012 Survey of Stations (MVM/UNR/USC 2012) – A survey run by MVM Consulting in coordination with the University of Nevada School of Journalism, where Marcotte is a visiting professor. Collaborating on the invitation only, online survey was PhD candidate Sandra Evans of The Annenberg School of Communication at the University of Southern California. 136 stations participated. 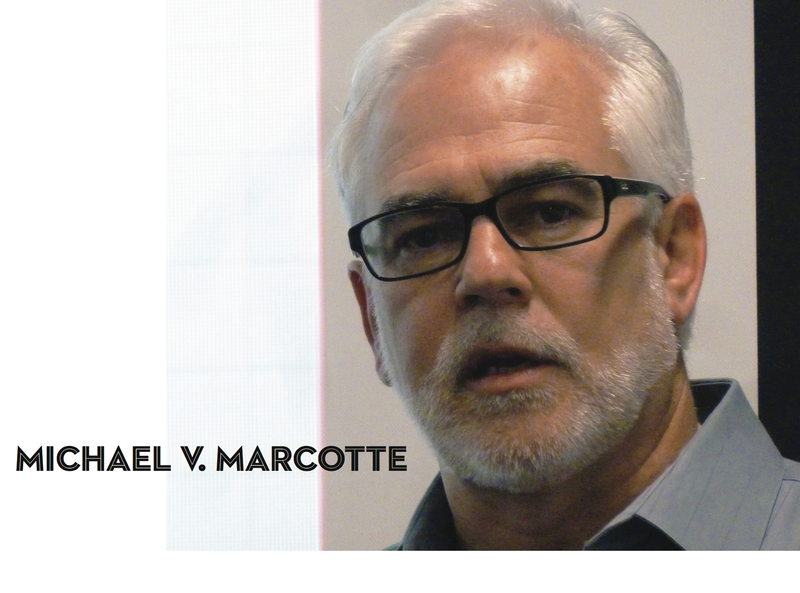 Michael V. Marcotte is the 2012-2013 Reynolds Chair in Ethics of Innovative and Entrepreneurial Journalism at the University of Nevada, Reno. He is a 2011 Knight Fellow of Stanford University. For 20 years, Marcotte served as a public broadcasting news executive in Seattle and San Diego. Now based in Albuquerque, he runs a consultancy for public media advancement.